COLUMBIA, Md. – For the first time since 1998, Kingsborough (NY) CC has claimed an NJCAA Championship following an impressive sweep of the men’s and women’s competition at the 2017 NJCAA Division III Outdoor Track and Field Championships. In the men’s final team standings, Kingsborough finished with 161 points to outpace Rowan Gloucester (NJ) who finished as the national runner-up with 117 points. Onondaga (NY) finished third with 80 points. 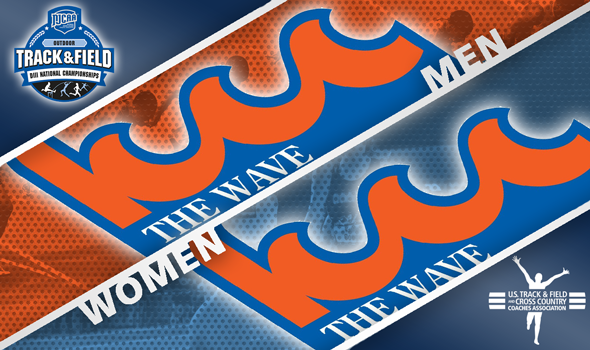 On the women’s side, The Wave claimed the top spot in the women’s standings with 138 points to outlast Harper (IL) who finished with 127. Suffolk (NY) finished third with 74 points. The Kingsborough men dominated on the track, winning eight events – including all three relays. The women also won eight event titles. The two team national titles won by Kingsborough at the event are just the second and third in school history – and the first since the college’s DIII men’s tennis championship in 1998. Below are highlights from the NJCAA Division III Outdoor Track & Field Championships. Malik John and Theodore Westcarr finished first and second in the 100 meters with respective times of 10.76 and 10.83. John also won the 200 (21.35), which featured a top three sweep for Kingsborough consisting of Mauriel Carty in second (21.41) and Rogike Thorpe in third (22.06). Stephen Cadogan, Kailon Kirby and Anija Addison swept the top three spots in the 400 for Kingsborough, clocking in at 49.01, 49.10 and 50.07, repectively. In the 800, Cadogan picked up another first place finish with a time of 1:58.43 while Addison finished in third place at 1:59.78. Paul Chillo‘s time of 16:04.94 in the 5,000 secured another first place finish for Kingsborough. Chillo also finished fourth in the 3,000 steeplechase (10:07.22). Kirby, John, Thorpe and Carty sprinted to a first place finish in the 4×100 relay with a time of 41.98. Kingsborough’s relay team of Kirby, Shawn Rene, Addison and Cadogan posted a time of 3:20.01 in the 4×400 to win the title. Rene, Ji-Aire Jones, Cadogan and Addison would also place first in the 4×800 relay win a dominating performance of 8:02.48. Peter Flacco of Rowan Gloucester set a new championship record in the javelin with his impressive throw of 63.82 meters. Tatyana Mills powered Kingborough’s quest toward the women’s crown, winning the 100m (12.19), 200m (24.18) and 400m (59.70) in addition to finishing second in the long jump (5.28m). Shantal Rouse, Thea General, Tanisha Witter and Mills set a new championship record in the 4×100 relay with a time of 48.66. Mills, Rouse, General and Ajani Bethea-Nurse also set a championshp record in the 4×400 relay, finishing with a time of 3:59.65. Kingsborough’s Keziann Jones dominated the throwing events, winning individual titles in the shot put (12.45m), hammer throw (42.75m) and javelin (35.09m). Andriana Higgins of Roxbury (MA) set a new meet record in the 100 hurdles, clocking in at 14.53. She also finished first in the 400 hurdles with a time of 1:07.65.